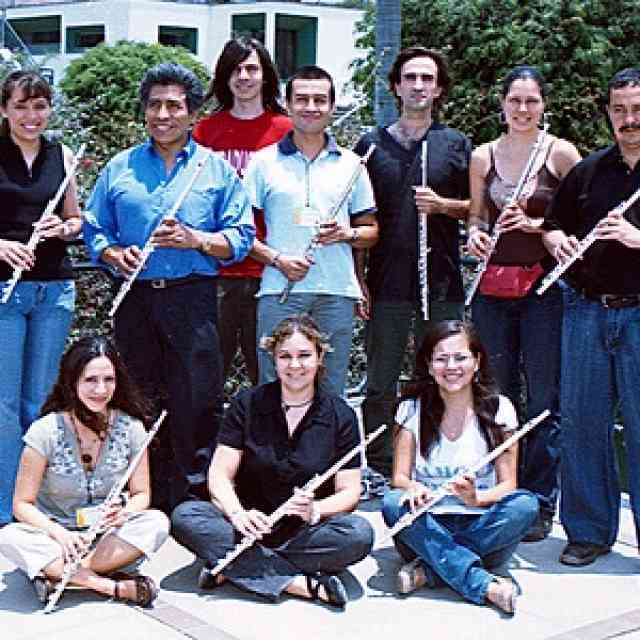 Under the slogan associated with music for a better world, in 2008, Colombia celebrated ten years of Suzuki Festivals. Since then, the organizing team has not stopped their joint efforts to continue making this wonderful experience possible. 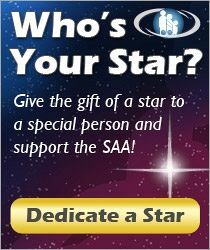 Today, in the midst of preparations for our 2012 festival, we express our gratitude to all people and institutions that are still with us year after year in this great challenge of education and training teachers in the Suzuki method to promote in our children the spirit of music as an integral part of their lives. With the support of the SAA in 2011, we were fortunate to hear again in the corridors the bass and the warm notes of the cellos, inviting and receiving for the first time teacher trainers like Barbara Barber (violin), who left us with a gift of books, and Barbara Balatero (cello), who shared amusing anecdotes at the festival office. The days were intense and full of hard work but also full of happiness and satisfaction with our progress. We were joined again by two wonderful and unconditional trainers who have accompanied us thirteen years: Marilyn O’Boyle and Caroline Fraser. Our festival is growing and growing up, and this motivates us to continue with this work. It’s really exciting when we see that children do not want to end their festival week because they truly enjoy the activities, lessons, group classes, alternative workshops, and orchestra. They meet many children who come from other cities and even other countries like Peru and the United States, and they make special bonds of close friendship. Definitely, the festival is a time of the year that children, parents, and teachers always await with great excitement and expectation. Last year it was possible to offer thirty scholarships. Fifty teachers attended the philosophy course, and about 100 more did their training in guitar, piano, violin, cello, and enrichment courses like Suzuki Early Childhood Education, First Steps, parents’ education and Body Balance. We are really happy that teacher trainers and guest teachers continue accepting our invitation to come to Colombia. To them, lots of thanks! MaryLou Roberts (guitar), Melissa Hullman (violin), Gloria Velasco (violin and orchestra), Marilyn O’Boyle (violin), and Caroline Fraser (philosophy and piano). Our learning has been steady and our good teamwork allows us to say happily: Long live the festival! 2012 Un Festival que no para de crecer! Bajo el lema, asociados por la música para un mundo mejor, en el año 2008 Colombia celebró 10 años de Festivales Suzuki, y desde entonces el equipo organizador no ha parado de unir esfuerzos para seguir haciendo posible esta maravillosa experiencia. Hoy, cinco años después, en medio de los preparativos para nuestro festival 2012, expresamos nuestra inmensa gratitud a todas las personas e instituciones que nos siguen acompañando año tras año, en este gran reto de formación y capacitación de profesores bajo la filosofía del método Suzuki, con el fin de promover en nuestros niños y jóvenes el espíritu de la música como parte integral en sus vidas. 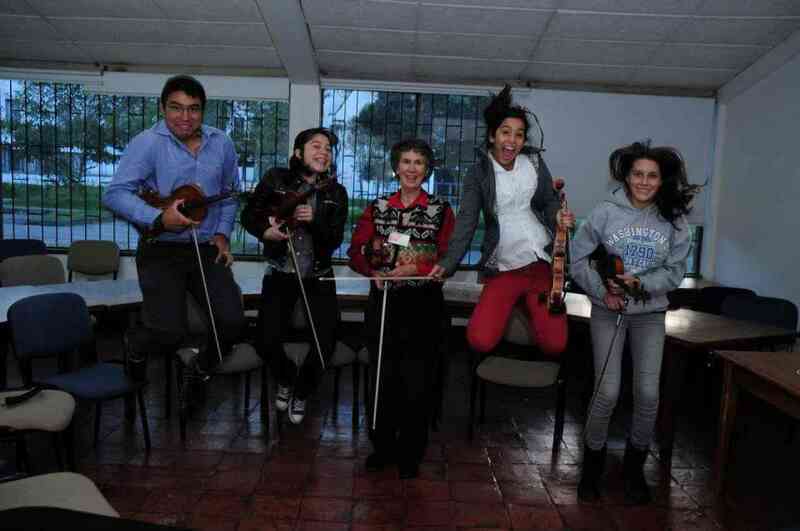 Gracias al apoyo de la SAA en el 2011, tuvimos la fortuna de volver a escuchar por los corredores, las notas graves y cálidas de los violonchelos, invitar por primera vez y recibir en casa a nuevos maestros entrenadores, como Barbara Barber (violín) quien se despidió con libros de regalo… y Bárbara Balatero (cello) compartiendo divertidas anécdotas en la oficina del festival. En fin… días de trabajo intenso, pero llenos de felicidad y satisfacción de poder avanzar con éxito. 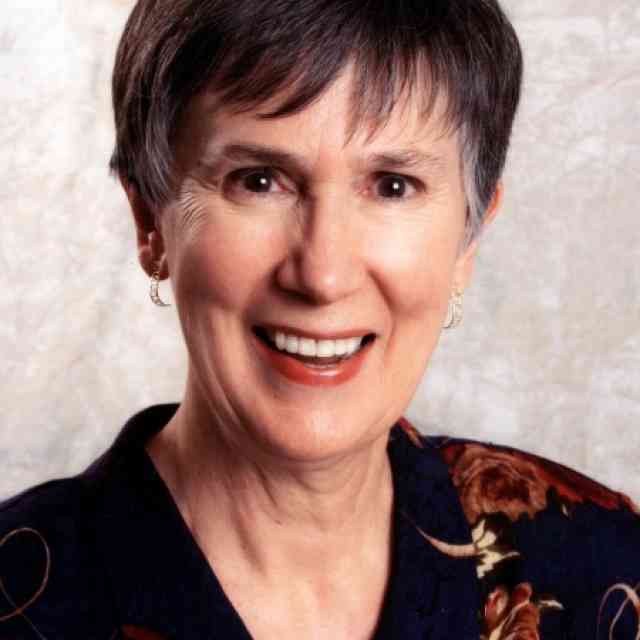 Así mismo, dos maravillosas e incondicionales maestras, que nos han acompañado trece años consecutivos, Marilyn O’Boyle y Caroline Fraser. Nuestro festival crece y crece cada vez más y esto nos llena de motivos para continuar con esta labor. Realmente es emocionante cuando vemos que los niños, no quieren que acabe su semana de festival, pues disfrutan las múltiples actividades, clases individuales, clases grupales, talleres alternativos y orquesta. Se encuentran con muchos niños que vienen de otras ciudades e incluso de otros países como Perú y Estados Unidos, estrechando especiales lazos de amistad. Definitivamente el festival es un momento del año, que niños, padres de familia y profesores esperan con gran emoción y expectativa. 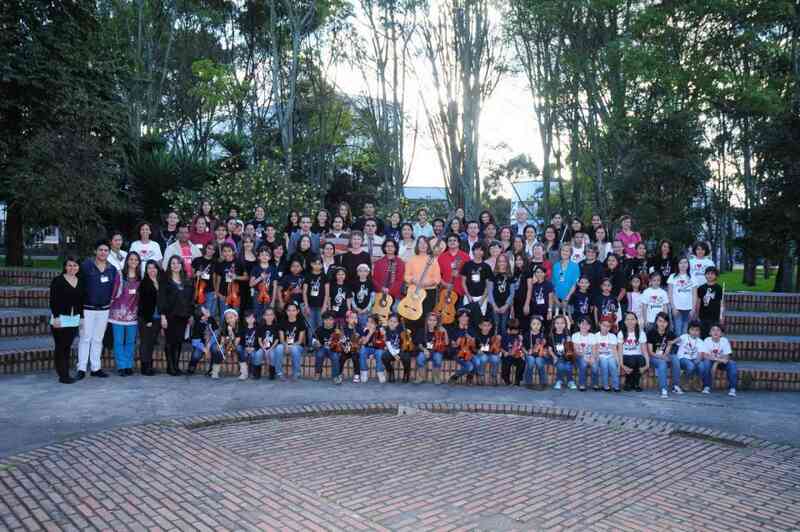 El año pasado pudimos ofrecer 30 becas, teniendo en el curso de filosofía 50 profesores, y alrededor de 100 profesores más, realizaron su capacitación en guitarra, piano, violín, violonchelo y cursos de enriquecimiento como estimulación temprana, primeros pasos, educación de los padres y balance corporal. Estamos felices de que los maestros entrenadores y profesores invitados sigan aceptando venir a Colombia. A ellos, muchas gracias!! Mary Lou Roberts (guitarra) Caroline Fraser (filosofía y piano), Marilyn O’Boyle (violín), Melissa Hullman (violín/balance corporal) y Gloria Velasco (violín /orquesta). Nuestro aprendizaje ha sido constante y el buen trabajo en equipo nos permite decir alegres: Que viva el festival! Director of Andantino Studio. Music for everyone! 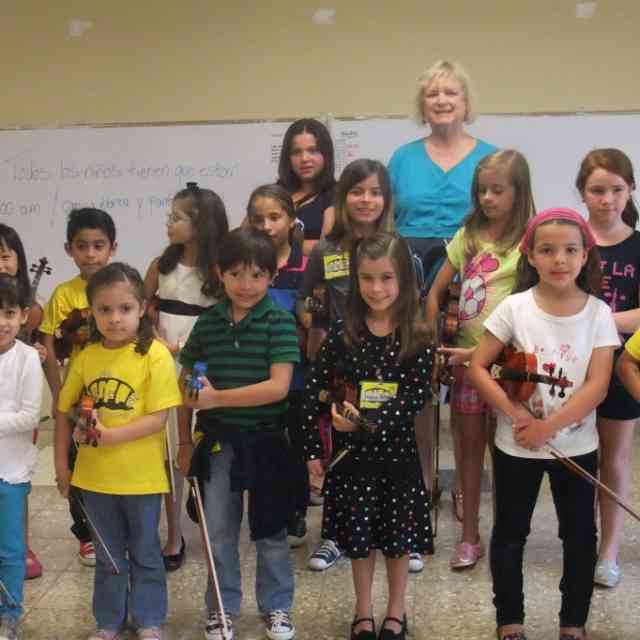 Collaborator of the Suzuki Festival in Colombia and Violin Teacher.